WRAPPING IT AROUND – Nico Myatovic (left), of the Prince George Cougars, wraps the puck around Yukon Rivermen goalie Devin Vogel on Saturday. 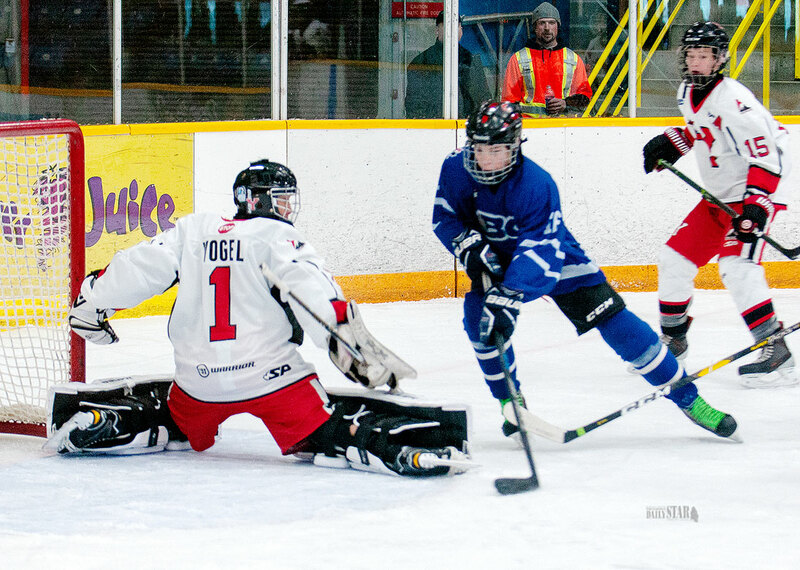 The Rivermen and Cougars played three games over the weekend. The Cougars won all three games. The Yukon Rivermen returned home to Whitehorse after a weekend on the road in Kelowna. The Yukon Rivermen returned home to Whitehorse after a weekend on the road in Kelowna. The Rivermen faced-off against the Prince George North Central Cougars for three games over the weekend at Takhini Arena. The Cougars, who have played 20 games to the Rivermen’s 10, showed they were the more polished team in the first game, winning 16-0. Despite the loss Rivermen Head Coach Carl Burgess says the team is beginning to gel, a task made more difficult than other teams in the B.C. Hockey Bantam Tier One Zone League, as the Rivermen cannot always practice with their full squad. On Saturday, the Rivermen were able to improve upon the previous nights game. The Rivermen lost 10-3, but were able to generate more offensive zone time, scoring the first goal of the game when Neveah Webb banged home the puck, five-hole, on Cougar goalie Tysen Smith. The Cougars were able to score three unanswered goals in the remaining part of the first period. They scored three more goals to begin the second period before Johnny Timmons got one back for the Rivermen. Timmons was tripped on a breakaway and awarded a penalty shot. One-on-one with the goalie, Timmons went backhand to forehand sliding the puck under Smith’s pad, to cut into the Cougar lead, 7-2. In the third period, the Rivermen were able to generate scoring chances, but could not find the back of the net until Scott Cousins found the twine with 2:14 remaining in the game. Although it was another loss for the team, Burgess thinks the team is heading in the right direction, and are staying consistent with the team’s motto - improve every game. “You can measure wins and losses with much more than the scoreboard,” said Burgess. “It’s about getting used to this level of hockey for these boys and girls, and I think we are turning the corner. Our strategy is that the first half of the season prepares us to do really well in the second half of the season, and we are on track for that. The Rivermen and the Cougars hit the ice one more time on Sunday to close out the series. The Rivermen once again improved on their Saturday showing, but still fell to the Cougars 7-2. In the Sunday game at Takhini Arena the Rivermen were able to improve and maintain pressure at all points of the rink and in all three zones. Burgess says in the third game the Rivermen began taking the game to the Cougars. The Rivermen will continue their season this coming weekend when they host the Fort Saint John Trackers in another three game home series. The team is looking to continue improving and believe they have the competitiveness to do so.